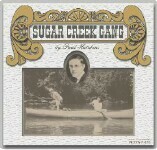 Get a Sugar Creek Gang 2-CD audio story for only $4.95 and FREE shipping! Just CLICK HERE for more info! For over 50 years, generations of children have thrilled to the faith-building adventures of this courageous Christian "gang". Paul Hutchens wrote these legendary escapades -- and God has used these anointed, action-packed stories to bring many boys and girls to salvation... and on into practical discipleship! We are seeing the fruit of the long-ago vision of Paul Hutchens even today! Click HERE to read recent letters from parents and then contact us to find out how you can be a part of this growing ministry. Click HERE for Rick Mannor's Sugar Creek Gang fan site! Click HERE for 72 hours of the original Sugar Creek Gang audio stories on CD -- for in-home listening or family trips on the road! the books -- best price on the internet! CBD donates a portion of every sale to support this site. 'Adventure Time' was the original Sugar Creek Gang broadcast for radio! For many years Adventure Time was aired on HisKids Radio and also as a part of the Captain's Club show on BBN. a living relationship with God! 2002 - 2013 Beloved Books, All Rights Reserved.